Based on a bizarre article published by Weekly World News in 1992, Bat Boy tells the story of a half-boy/half- bat creature who is discovered in a cave near the fictional town of Hope Falls, West Virginia. Madness ensues as the townsfolk investigate a mysterious “cow-killing plague” and its suspicious connections to the bat boy. For lack of a better solution, Sheriff Reynolds brings Bat Boy to the home of the town veterinarian, Dr. Parker, where he is taught to act like a "normal" boy by Dr. Parker's wife, Meredith and their teenage daughter, Shelley. 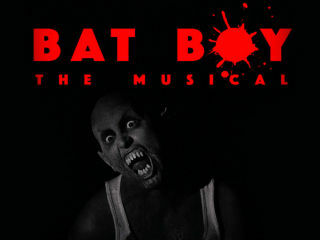 Set to an infectious score by Laurence O’Keefe, that spans nearly every genre of music from classic Broadway to driving rock, Bat Boy exposes the gritty truth about acceptance and prejudice. Taking a look at family and love through an off-kilter plot filled with zany characters, Houston audiences will gasp, laugh and cry through the nightmarish ride of Bat Boy: The Musical.